Sink Drains for your bathroom sink. 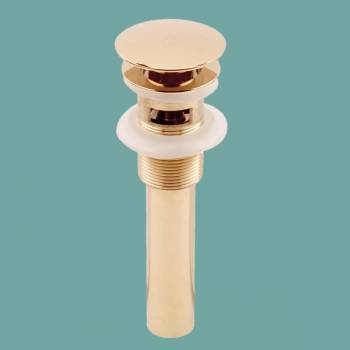 Sink Drains: PVD Brass Push-Button Pop-Up Drain with Overflow. Lasting solid brass construction with Physical Vapor Deposition (PVD) finish. Polished brass or "gold" finishes with PVD are extremely durable and tarnish resistant. This unique drain has a push button pop-up feature; simply push the drain stopper to open and close the drain!